00:25:00 Makes 8 servings, 1 cup (250 mL) each. 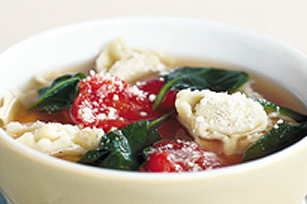 Turn a package of cheese tortellini into a savoury soup with our Tortellini Soup recipe. With only 10 minutes of prep, you'll be digging into a steaming bowl of soup in no time. Combine tomatoes, broth, water, herbs and dressing in large saucepan. Bring to boil on medium-high heat, stirring occasionally. Reduce heat to medium-low; simmer 5 min. Add pasta; stir. Cook 5 min., stirring occasionally. Stir in spinach. Remove from heat. Let stand 2 min. Serve with crusty whole grain bread on the side along with your favourite dessert. Prepare as directed, using frozen tortellini. Just cook a few minutes longer before adding the spinach. Add 1 Tbsp. Classico Basil Pesto di Genova along with the pasta. This great-tasting soup, made with better-for-you products, provides an excellent source of vitamin A from the spinach.